On Election Day, we are asking young adults who were adopted internationally and their families to celebrate their freedom to vote by posting an election day ‘selfie’ with your “I Voted” sticker on Facebook. When you login to Facebook today, you will see a “Vote” banner at the top of the timeline with an option to share that you voted. 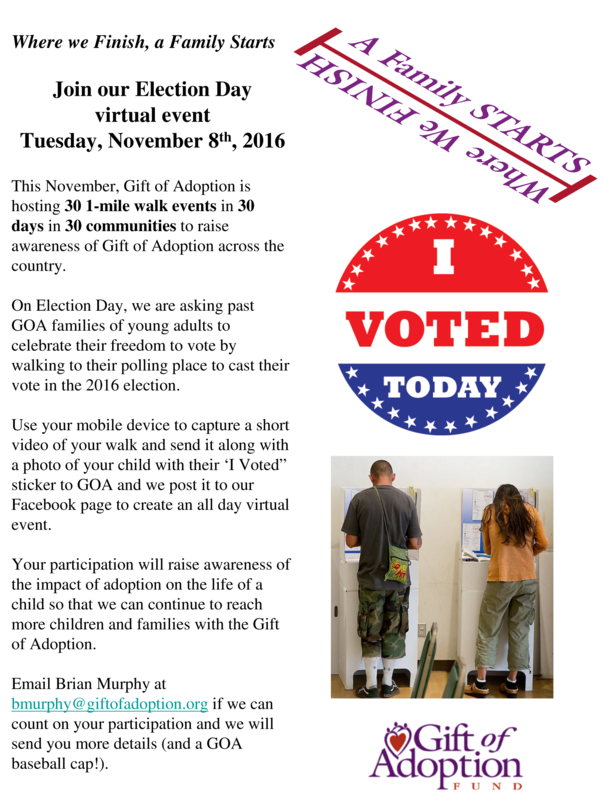 Click the link to post your voting status and upload a selfie w/ the I Voted sticker and tag @giftofadoptionfund. DO NOT TAKE PHOTOGRAPHS INSIDE YOUR POLLING PLACE (doing so is illegal in many states). Your participation will raise awareness of the impact of adoption on the life of a child. Email bmurphy@giftofadoption.org a link to your profile and we will mail the first 10 voters a free Gift of Adoption ball cap.